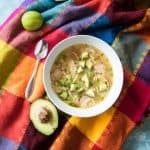 So full of shredded chicken, chunks of avocado, bites of radish, and amazing lime and cilantro flavors, this super satisfying Chicken Avocado Lime Soup is one of my all-time favorites. Oh, and it's Whole 30 compliant. In a large pot, heat the olive oil over medium-high heat. Add the green onions and jalapeno and saute for 2 minutes, just until tender. Add garlic and saute for 30 seconds more. Pour in the chicken broth and water, then add the chicken breasts, tomatoes, cumin, oregano, and coriander, and salt and pepper, to taste. Bring to a boil, then reduce heat to medium and cover with a lid. Allow the soup to simmer for 10-15 minutes, or until the chicken breasts are cooked through. Remove the chicken and turn the heat down to medium-low. Add the radishes. When the chicken is cool enough to handle (about 5 minutes) shred with two forks or put it in the bowl of a KitchenAid mixer and use the beater to shred it quickly (such a great kitchen trick that I use whenever I need to shred meat!). Add the shredded chicken back into the soup, along with the lime juice and chopped cilantro. Add the avocados just before serving the soup, or put about 1/2 cup of chopped avocado into each serving bowl before ladling soup over the top. You can also add crushed tortilla chips, sour cream, or shredded cheese, if you desire.